Minister of Education, Hon. Rev. Ronald Thwaites (right), converses with Board Chairman, Jones Town Primary School, Maria Jones, during a special forum on primary education held today (Oct. 10), at the Jones Town Primary School in Kingston. Plans are in place to develop the Voluntary Organization for the Upliftment of Children (VOUCH) as a centre for the assessment of children with special needs. The Educatiom Minister said the Government is committed to providing places where students with special needs can be assessed and given assistance. VOUCH, a non-governmental agency, was created in 1979 with the merger of two children’s organizations - the Child Welfare Association and the Jamaica Children’s Service Society. Plans are in place to develop the Voluntary Organization for the Upliftment of Children (VOUCH) as a centre for the assessment of children with special needs, says Minister of Education, Hon. Rev. Ronald Thwaites. “VOUCH, we hope, will become a centre where the specially trained teachers in the schools (and) the parents can take the child, and have the child assessed, so that the therapy and plans to help that child can go ahead,” he said. The Education Minister was addressing a special forum on primary education on Thursday, October 10, at the Jones Town Primary School in Kingston. Citing his own experience, the Education Minister said he was “a dunce bat” for the first two years in school because he was placed to sit at the back of the class and was unable to see the board. “They never found it out until the first two disastrous years and then they gave me a pair of glasses and the rest is history because I could see,” he said. He said the Government is committed to providing additional places where students with special needs can be assessed and referred to the relevant institutions for assistance. “Many of us have problems of one sort or the other, and so we are providing a place not only within the school,” he said, noting that emphasis will also be placed on having trained special education teachers in the schools. VOUCH, a non-governmental agency, was created in 1979 with the merger of two children’s organizations – the Child Welfare Association and the Jamaica Children’s Service Society. The Minister also used the opportunity to hail the institution for its contribution to national development since its inception in July 1913. 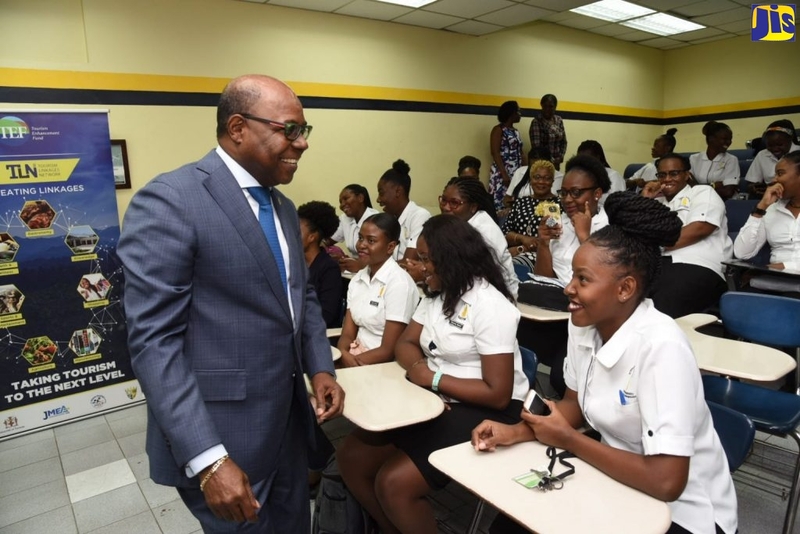 He reiterated that a sound education is critical to the continued development of the nation, which can only redound to the benefit of Jamaicans. “If we want to encourage our communities to get better, if we want our nation to survive and thrive, then education has to be the key, it is the number one investment. No amount of logistics hub, no amount of garment manufacturing, no amount of factories or JEEP work, can take the place of a sound education,” he argued. Minister of Transport, Works and Housing, and Member of Parliament for South St. Andrew, Hon. Dr. Omar Davies, who also attended the forum, said that Jones Town Primary remains one of the central institutions within the community. The special forum on primary education represented part of the Ministry’s contribution to the centenary celebrations of the school. The institution caters to approximately 300 students, and has 13 teachers and two guidance counsellors.